KARIYA, JAPAN, Dec, 21 2018 - (JCN Newswire) - DENSO Corporation along with some of the startup companies it's backing, will be showcasing the future of mobility through its latest technology solutions at the Consumer Electronics Show (CES) in Las Vegas, Nevada, North Hall, booth #4619, from January 8-11, 2019. 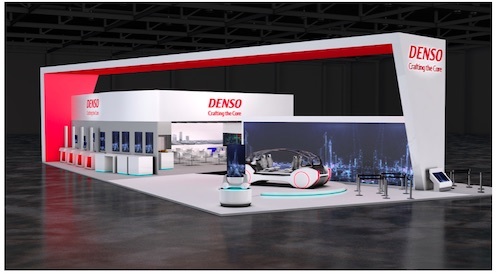 At the show, DENSO plans to feature the latest in automated driving and connected technology as part of its long-term commitment to help create the future of mobility. The technologies on display - from cybersecurity applications to cloud technology connecting vehicles to outside networks to carsharing features and more - further support the company's recent push into software-based solutions to complement its hardware expertise. They also represent the breadth and depth of technical areas DENSO is exploring and advancing to enhance safety and reduce environmental impact in the ever-changing mobility landscape. "Automotive is at a pivotal moment in which traditional products and parts are evolving and cloud computing, artificial intelligence and V2X are the future," said Bill Foy, senior vice president, Engineering, DENSO International America. "We're excited to be attending this year's CES conference to showcase the software solutions and technologies positioned to disrupt the industry and shape the future of mobility." - Telematics terminals for fleet management, and more. In addition, DENSO will be joined at its booth by five of the startup companies it has backed as part of its long-term vision to accelerate innovation in electrification, automated driving, connectivity and the shared economy. The company has invested nearly $100 million in startups around the world, building a strong partner ecosystem - in and outside of automotive. - Dellfer will demonstrate a live cyberattack, generate an instantaneous alert on it in the cloud, and stop the attack from progressing further. - Metawave will show video of its van demo occurring at CES, which highlights the company's advanced automotive radar and AI platform that classifies and distinguishes between autos, bicycles, pedestrians, and other objects at long ranges. - Thinci will demonstrate its Graph Streaming Processor, Autonomous Driving Suite, and Plug & Code AI Platform. - Canatu will display smart 3D shaped touch surfaces for car interiors, reducing driver distraction and the new 3D shaped heating solutions enabling autonomous driving in any weather. - Ridecell will showcase the features of a free-floating car sharing service, showing the full lifecycle of a rental, from back-office to actual vehicle, including the ability to remotely lock and unlock a carsharing vehicle.